Gardening is one of the most therapeutic hobbies a person could have. From running your fingers through the soft soil in the ground to pruning away at your rose bush – having such a direct impact on nature and the environment is a feeling like no other. However, it can sometimes become more of a chore than a hobby, you may feel like your garden is getting a bit too far ahead of you and it’s becoming difficult to control. Gardening is fun, healthy, and an ingenious way to enhance you and your family’s lifestyle. So, simplifying aspects of your gardening tasks can make them a lot easier and more enjoyable – allowing you to spend less time working in the garden, and more time relaxing in it. The following tips will make your gardening experiences easier and more enjoyable, while still retaining the therapeutic elements we all love. Healthy plants obtain fewer diseases, attract fewer insects, and require less feeding – but how do we get healthy plants? With healthy soil. The most effective natural way to get healthy soil is from mulching. Many gardeners see mulch only as a decoration, as composted mulch is a lot more aesthetic than the average soil. However, mulch has a range of benefits: it keeps soil and plant roots cool, retains moisture, prevents weeds from sprouting, and feeds the soil with all essential nutrients. That handful of benefits will cut down on the time you spend on watering, weeding, fertilising and feeding! It is sometimes difficult to properly define boundaries within your garden for different plants, and this can make it harder to cater for all the needs of your variety of plants. By installing containers and raised beds, you give yourself ultimate control over your garden. With containers, you monitor the soil type, water dosage, light exposure and even the amount of growth of your plants. 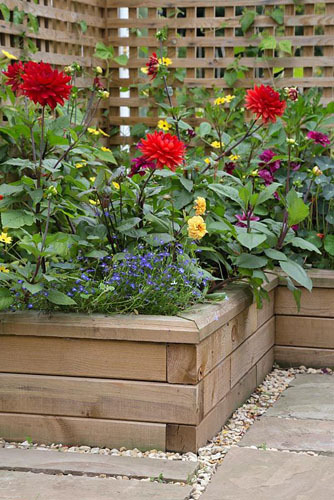 Raised beds can isolate your garden beds from their surroundings. This means you’ll have full control over the borders, and due to the looseness of the soil, you’ll find fewer weeds sprouting. By raising your garden beds, they’ll be out of reach from many pests, they’ll take up less space in your garden, and you’ll be saving your back from the constant bending as they can be as high as you like. Heavy maintenance chores like deadheading, watering, and harvesting takes up a lot of your time in the garden, especially when your plants are scattered all over the place with different requirements. The saying “the right plant for the right spot” is only the start of saving time in your garden. Putting sun lovers in the sun and ground covers in a load of space is great. But imagine putting all your water loving plants in one section of the garden, and all the plants that require regular deadheading in another section. That way, you can still mix different bloom times and everything else, but all the heavy tasks will be consolidated in one or two specific areas, saving a lot of time in the long run. A drip irrigation system doesn’t just save water; it also saves a lot of time. Gone are the days of you waking up early to water the plants: with an automatic system, your garden will already be fully watered by the time you’ve woken up! Now, many people expect irrigation to be an expensive investment for their garden, but this is rarely the case. There is obviously an initial cost, but in the long run, irrigation could save you heaps of money on your water bill – unless you solely rely on rain to water the plants. Drip irrigation is one of the most efficient ways to water your plants. Plus, every drop you use goes exactly where your plants need it most! You’d be surprised how effective a good set of tools can be in the garden. Gardening involves a lot of repetitive motions which can be stressful for your joints – mainly the wrists, knees, and back. Thankfully, modern tools have been manufactured with the gardener in mind. Nowadays, the tools work with gardeners a bit more, taking some of the bending and squeezing out of the labour-intensive work. Things like bent rakes, cushioned handles, and ratchet pruners are just a handful of helpful tools you can grab at a low price. Picking tools that are the right size for you and fit comfortably in your hands is essential to ensure you’re working efficiently. Another great tip is to keep your tools nice and sharp. Shovels, pruners, and every other tool works best when sharpened. A grey area for many gardeners. Should I? Shouldn’t I? Although many will choose natural grass over artificial grass, it is still an excellent time saver. Modern artificial grass can look very realistic, and there are a number of style choices on offer. It takes a lot of time and effort to produce the perfect lawn. Constant watering, seeding, cutting and repeating is required until you’ll be happy with the outcome. Not only will artificial grass save you money on watering and grass seeds, but it also allows you to eradicate the most monotonous task in the garden – mowing the lawn! Check out this guide to artificial grass and decide whether it’d be a good fit for your garden. It may seem obvious, but using a wheelbarrow will save so much time when gardening! How many times have you thought about reorganising your garden, moving your potted plants about, and replacing your outdated birdbath with a brand new water feature? More times than you can count I bet! But, the thought of spending hours carrying things back and forth has always put you off, hasn’t it? Using a wheelbarrow will at least half the time you would have spent carrying out these tasks on foot. And it doesn’t stop there. You can use the wheelbarrow to carry your tools, move plants, remove weeds, and harvest your vegetables! Getting your children and grandchildren involved is one of the best ways to make your gardening a little bit easier. Teach them how to weed and water plants; show them bugs, worms, roots, and sprouted seeds. Anything from mucking around with soil and water, to planting and harvesting will be hugely beneficial to the children. Learning about the environment and everything that comes with it should be an essential part of every child’s education, and learning about it in the garden is one of the best routes to take. Maybe having your children/grandchildren in the garden won’t necessarily lessen your workload, but they will be great company and will make the tasks at hand more enjoyable! This entry was posted in Expert advice on September 11, 2017 by gapadmin.